Well, of course...loads of 'myriads' have been stitched over a cup of coffee, legendary conversations brewed, the spur of 'artistry', glorious collaborations and of course the essence of an animated debate. Coffee has managed to inspire creative minds, at least that is what I feel, and when creative minds mingle...the outcome is 'fabled' to say the least. And talking about the 'theme of discussion' ...well, it is disparate...almost like an universal set, this one. But then, yes my observation skills say that light-hear-ted topics can often yield interesting results..it does. We did start off with the sports-centric symposium, those heated up deliberation on the key pain-points of the current Indian cricket team...the argumentation on their their serial failure in pace-friendly conditions, but then Rohit's unexpected entry scripted a refreshing annulment. We quickly shifted gears from the '22 yards' into another form of extolled entertainment- Bollywood; Rohit's indirect attachment with the silver screen did stimulate the conversation. "Dude...this Dhoom 3 is shattering all records, 500 crores is not a mere figure...it says a lot about the man who controlled the proceedings" - The perfect start to an engaging debate. The numbers were given first preference nevertheless, that was Pritam's call, the blind Aamir fan. We knew that we would face an array of questions after such a statement. "Dude, do you think that numbers really mean anything? If it did, Chennai Express would have been termed as the 'Movie of the Year'...the commercial bend doesn't add an extra bit of certification to any motion picture, yes I agree to the fact that these movies draw wide-spread response and that is precisely because appreciate the superficial constitution. And, of course, everyone's a film critic these days...." - As expected, the bouncers followed; and as expected Rohit was the ferocious bowler. We were aware of the fact that he had a serial hatred for commercial movies, the ones which looked illustrious on the face of it...but were shallow inside. A cumulative nod signaled the flag-waver as Rohit took up the virtual mic and unleashed the flow. "The Stage is all yours mate". "Let me start off with a movie that's very close to my heart- A Wednesday...not merely because of the fact that I am a Naseeruddin Shah fan or a Anupam Kher devotee, but the fearless portrayal of the sequestered grievance implanted deep within every moral residing in a hub of disturbance. It is a fact that we have been ruffled by the recent spurt of PDA (Public display of atrocities) in every form but there's a strange bit of oblivion that has cast a pervasive blur. A Wednesday, I feel, is an eraser...it is quite a dauntless, intrepid attempt that would perhaps establish the TRUE meaning of the sarcastic exegesis 'Do not under-estimate the power of a common man' . But the only point of deliberation remains in the fact that how many of us, can actually step up to the task and take it to the next level, just like the "Common Man" a.k.a Naseeruddin Shah did. The 'thriller sheath' with a firm statement of moratorium was perhaps the best of it's kind in recent times. The fascinating screen-play and cutting dialogues like 'They asked us this question on a friday, repeated it on tuesday ... I'm just replying on Wednesday' or 'Aam aadmi ki tarah jiyo, aam aadmi ki tarah bardaash karo aur aam aadmi ki tarah maro' did create a very strong statement...loud applause for Neeraj Pandey for vanquishing those preconceived notions and portraying the veracious face of truth in a simple, lucid manner. The narrative format and the mysterious line-wrapper added a wonderful blend to the entire series of events. 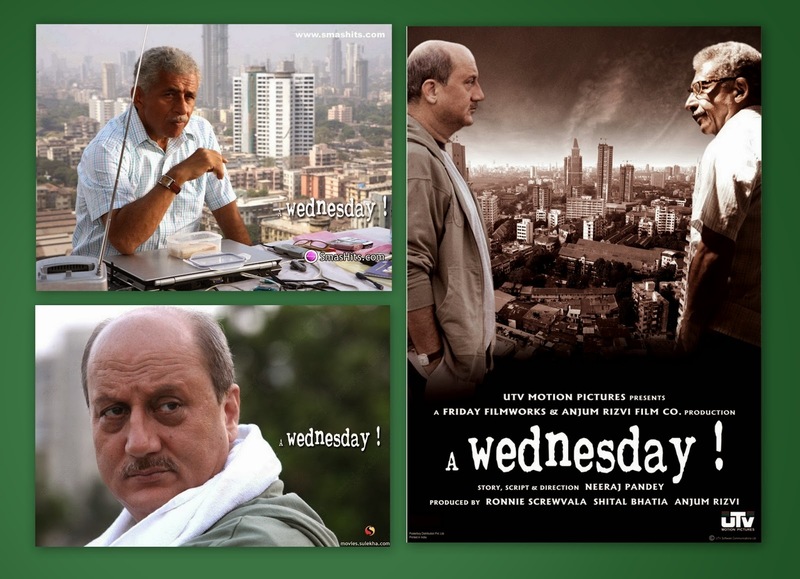 A Wednesday did speak a lot, and it shook the entire nation much like Rang De Basanti. It is a must-watch" - Pin drop silence prevailed... as he paused to regain his breath. Rohit is a man to vouch for, especially when you need an unbiased opinion...his reciprocation is exemplary. I did read his blog a couple of months back, he was quite a critic. "Should I continue?" - His resounding tonal quality broke the trance. He had scripted a rollicking start. We nodded. "Alright, the next on my list is another refreshing story that re-established the concept of unrestrained expression, of course, with a different flavor was Vicky Donor. I bet, nobody would have imagined this low-budget, 'drab-cast-blended-flick' would create such an impact..the reason being the general perception regarding the Indian directors who have been tagged with the 'masala-centric-expertise'. "Who cares?" - Was perhaps the driving force when the very talented Shoojit Sircar and the 'macho-man' Mr Abraham decided to take this forward. They wanted to highlight a forbidden corner of our society, the corner that could have never baked into sunshine, that could have been suppressed and concealed..just to serve the purpose of so-called 'sanity'. Yes, my friend, the story that revolved around the hunt for an efficient and high performing sperm donor did explore other avenues in effect...the tale went deep into his chords and extracted those proscribed angles. The movie is not a mere depiction, I feel...it is a dart that is direction straight towards the audience, tickling their thought process that is generally driven by external factors...it is quite a one-to-one-correspondence that covers loads of details with a humorous adornment. I could sense a logical connect between the audience and Vicky's thought-process...be it parallel or anti-parallel, I could sense the appeasement when Vicky agreed to donate his sperm right at the very end....that is what a well-stitched movie is all about. Ayushmann's simplicity and Annu Kapoor's brilliance made it possible. The movie of the decade for me. "- Loud and clear...cutting words and cutting words of wisdom really. Great pick that one, I believe. "Aye Aye Captain..even we loved the story-line...the songs and of course Yami Gautam's grace"- We all acknowledged Subham's valuable input. Paani Da did touch our core, indeed. Ayushmann has come a long way since his Roadies triumph. "Okay, moving on...number 3 would be invariably something that is blended with a swell of yearning...a touch of nostalgia and the charm of rhythm-centric excellence 'devised' by Abhishek Kapoor and the legendary Shankar-Ehsaan-Loy. No points for guessing...yes, I am talking about the Farhan Akhtar-signature-invigorator Rock On...the melodious journey that saw Ups and Downs on the way, but it's indomitable spirit that held 'them' together. Yes, I am talking about Magik , the brainchild...that was pulverized, shattered before it could unfurl it's enchanted wings. The euphony that had just started to synchronize with the Nation-wide-concord, was literally plagued by the "battle-of-the-psyche" ...the dreams that were sewed together were complete dispersed. But, then the love for music had always been the driving factor...it did manage to soothe the dis-putative ferment...it did bridge the gap and create 'Magik' on the stage again. 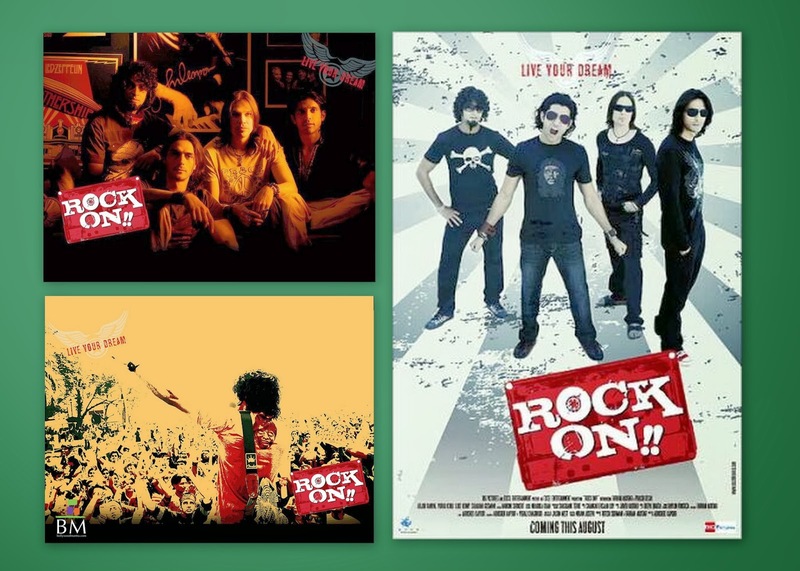 The movie wasn't about the pomp or the grandeur of a rock-star's life...it was quite a mundane depiction, the sketch that would perhaps change the general perception of "rock music" and of course their protagonists. It is really marked by the 'flamboyance' and 'easy-spirited' representation that not only bewitched the youth, but impressed the 'seniors' as well...somewhere down the line, there was a despondency...the vehemence, the 'drive'....didn't you all stand up when the last notes of "Sindbad The Sailor" were performed on stage? It has been such an epic tale of recollection, cognizance, flashback and a symphonious retrospection. Rock On ..is going to stay. Period." - I could see the glaze in his eyes as he paused again for a sip. Rock on was really an amazing experience, we were in our college days then....putting ourselves in their shoes was quite drippy. Glad that Rohit brought it up again, I guess it's time for us to re-unite again- My band - Brickz. "I hope, I'm not really spoiling it...am I? "- I'm not sure why he felt so..we were actually mesmerized at this proficiency, the way he analysed the script..the way he intruded into the director's mind. We were thoroughly enjoying the ride...it was quite a roller coaster ride. "Waiter! Another round of coffee please...."- And he got his answer..."Please continue"...was the implication. "Okay folks...I know there are many Chetan Bhagat fans out here...and that is why, I am pleased to declare that Kai Po Che has impressed me a lot, no only because it had that element of cricket in it, but because of the very fact that I loved the story in itself. This novel by Chetan ji (3 Mistakes of my life) has almost everything...friendship, lust, greed, gluttony, love, drama, action, rancor and of course the strong cognitive backbone that forces you to think beyond the ordinary. The barriers of religion and creed which is still the 'darker side' ...has been breached with a strong enactment, it needed the able 'Abhishek Kapoor' touch to add that altruistic bend. The defining factor of any 'successful feature' is about keeping the viewers interested, inspite of the very fact that they might be knowing the story before-hand....that makes the task all the more challenging. Sushant Singh Rajput was the perfect choice I felt, the exuberance depicted through Ishaan's 'envisaged screenplay' was the kick-start nevertheless. Amit and Rajkumar did splendidly well to back him up because at the end of it all...the spirit of amicability and empathy emerged as victorious. It also proved that the fallible animosity and the Natural atrocities could pose a transitory abeyance...but in the end, sanity prevails...the sagacity can never be overpowered. Ali's perfectly timed straight drive was an unyielding statement, abdication is not even an option. The visual and the auricular be-witchery was class apart..everything fell into the groove perfectly. The negative vibes were perhaps directed towards the 'well-planned trade-off' that could be explained perfectly with Edison's allegorical quote- Opportunity is missed by most people because it is dressed in overalls and looks like work. A passionate creation and a prodigious ramification." - Yes indeed. 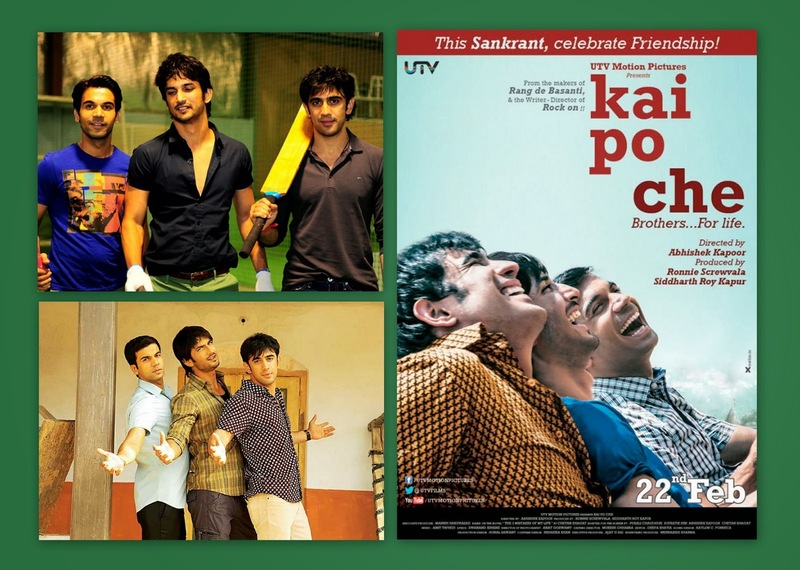 Kai Po Che did strike the chords...it received mixed reactions nevertheless because of a couple of technical gremlins...but it was indeed a compassionate revelation..'compassionate' because it honored the original story-line, the intensity never dropped and the glorious transformation from the first to the second half made it all the more gratifying. Oh well..the envisaged group discussion was turning into a one man extempore...not that we complained. Rohit was an amazing speaker...he had lovely voice modulations as well. And as Rohit took a much deserved break...I had to take up the 'center stage' - "So I guess, 'out-of-the-box is perhaps an overstatement....when we associate a movie with 'meaning' we gotta respect the director's point of view as well....the inter-twined POV's would actually result in a generalized conclusion. We have seen Indian cinema's reaching the peak of it's success in the last couple of decades, my success I mean it's esteem and prominence. And of course, the key 'characteristic' lies in the very fact that all of them are pretty much 'script-oriented' and not controlled by merely the central character...the strong back-bone of the story-line remains undaunted. Movies like Dhobi Ghat, Black, Mumbai Mirror, Shaitaan, Swades, ABCD have enriched the 'art' ..you have to choose your direction of 'interest' nevertheless." "So who's paying the bill?" - Rohit giggled. The hilarious punch-line indeed. * Image courtesy: Google images except the cartoon. (The collages have been made by me) . I have been writing movie reviews for a while now. You can read them here.